You really will not believe this one. 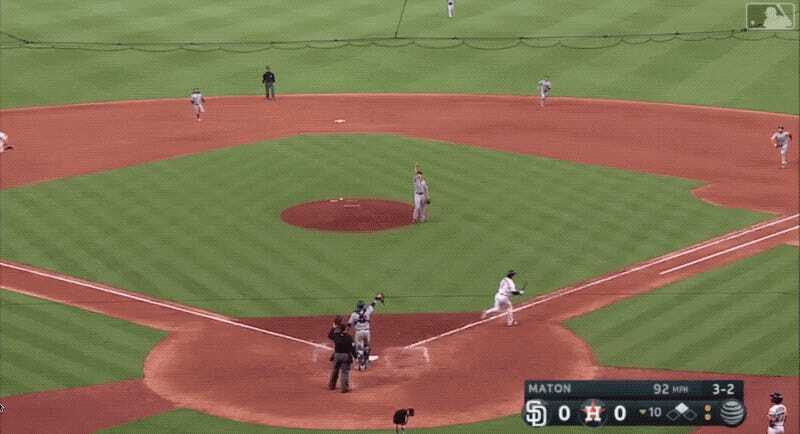 The Astros had a man on second with two outs in the bottom of the 10th inning last night, against the Padres, in a scoreless game. Batter Alex Bregman popped a rising 3-2 fastball from Padres pitcher Phil Maton straight up in the air. Easy out! Guaranteed out. Right, guys? Wooooooooooooooooooooooof. And there’s your ballgame! So what the hell happened? Watching the video, it looks like catcher A.J. Ellis spots the pop up and almost immediately points to first baseman Eric Hosmer; Maton spots it and takes a few not very convincing steps towards it; Hosmer, meanwhile, is trucking in all the way from first and, after taking a couple quick looks at his route, sure seems to be tracking the ball the whole way, right up until he appears to realize he’s overrun it, and slumps in defeat. I’m not sure what Hosmer means by “turn around.” I guess Ellis wouldn’t want to be facing away from home plate when he made the catch? I’m not sure why Maton didn’t take three steps forward and wave everyone off. On the other hand, I’m quite sure you will not see a funnier loss the whole rest of this baseball season. Bravo, everyone.